Explore Lima, the gastronomic capital and sample its iconic ceviche. Fall in love with the culture and landscape of the Sacred Valley. Visit charming Cuzco, and take the train to legendary Machu Picchu, a true wonder of the world. Discover Quito, the oldest capital in South America and try and spot giant tortoises and blue-footed boobies in the Galapagos Islands. 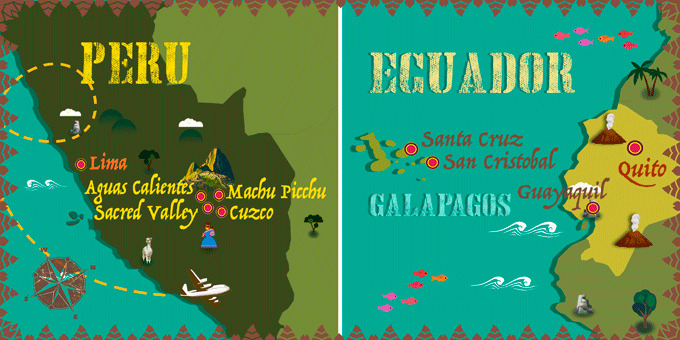 International flights: US - Lima & Guayaquil - US. 14 Breakfasts & 1 Lunch. Lima: Ibis Reducto Miraflores, Los Girasoles, San Blas Miraflores. Cusco: Yawar Inka Hotel, Maytaq Wasin, San Agustín Internacional. **** Possibility of booking optional excursions in the next step of the booking. Please note that all additional optional excursions which are not selected at the time of booking must be requested before final payment is made at least 60 days before departure. The final price will be shown once you have selected the optional excursions, in the final step of the reservation process. The optional excursion to Palccoyo operates from April to December on Tuesdays, Thursdays and Sundays. Outside of these dates you will visit the Mountain of Seven Colors in Vinicuna instead. And it does not operate between January and March. We strongly recommend you consult your GP regarding the possible effects of altitude sickness. Transit control card (TCC)* (US$ 20) and entrance to the Galapagos National Park * (US$ 100). Arrive at your US departure airport for a flight to Lima, the capital of Peru, situated on the Pacific Coast. Arrive, transfer to the hotel, and depending on the time, spend the rest of the day exploring at your leisure. Overnight stay in Lima. Breakfast at the hotel. Today transfer to the airport to take your flight to Quito. Arrive in Quito, the capital of Ecuador and a city famed for its high vantage point in the Andean mountains, and its ancient Incan significance. Transfer to your hotel and spend the rest of the day at your leisure, exploring the relaxed culture of the Ecuadorian Sierra. Overnight stay. Breakfast at the hotel. Enjoy a sightseeing tour of the historical parts of the city. You will visit a traditional market where you can taste a variety of locals fruits. In the afternoon you can explore Quito at your own pace. Overnight stay in Quito. Breakfast at the hotel. Today transfer to the airport to take your flight to the Galapagos Islands. Arrive at the Baltra airport, one of the Galapagos Islands and transfer to the island of Santa Cruz. You will cross the Itabaca channel on a ferry and then continue by car. Stop in the highlands of Santa Cruz. Visit a private ranch for lunch. Walk among the trees and look for the giant tortoises that can be found near the small lagoons. Visit the lava tubes, which form when the surface of a lava stream solidifies but the interior remains liquid and flows like a river. Continue your transfer to your hotel. Enjoy the rest of the day exploring at your leisure. Overnight stay in Santa Cruz. Breakfast at the hotel. Take the day at your leisure or choose one from our optional excursions to discover the delights of the Galapagos. * Overnight in Santa Cruz. * Optional Uninhabited Island Excursion: Travel by boat to an uninhabited island in the Galapagos archipelago, for the best opportunity to admire rare and beautiful wildlife. Spot colorful fish, sea turtles and maybe even the rare blue-footed boobies. Includes lunch and snorkelling equipment. Price per person: $275. Breakfast at the hotel. Enjoy the morning by exploring the beautiful island of Santa Cruz at your leisure. In the afternoon take a motorized boat to the island of San Cristóbal. Arrive on the island of San Cristobal, transfer to the hotel and overnight stay. Breakfast at the hotel. Spend the day at your leisure, or we recommend taking an optional excursion. * Overnight in San Cristobal. * Optional Uninhabited Island Excursion: Travel by boat to an uninhabited island in the Galapagos archipelago, for the best opportunity to admire rare and beautiful wildlife. Discover the unique rock formations of the islands and enjoy watching the colorful and unique birdlife. Includes lunch and snorkelling equipment. Price per person: $175. Breakfast at the hotel. At the indicated time, transfer to the airport for a flight to Guayaquil. Arrive, transfer to the hotel and spend the remainder of the day exploring at your leisure. Overnight stay in Guayaquil. Breakfast at the hotel. At the indicated time, transfer to the airport for a flight back to the US. Arrive in the US and end your trip. Galapagos transit control card (TCC) is mandatory and is checked at the airport in both Quito and Guayaquil before travel to the Galapagos Islands. Cost US$20 per person (subject to change) and made by cash payment. At the airport Galapagos passengers must present their transit control card (TCC) with their passport and pay the entrance fee to the Galapagos National Park. Cost: US$100 per person.